The Misuse of Drugs [Decriminalisation of Cannabis] Amendment Act 2017 does not legalize cannabis, however it does remove criminal offences for the simple possession of 7 grams or less of cannabis. This was explained by Minister of Social Development and Sports Michael Weeks who held a press conference this morning [Feb 26] on the Act, where he noted that it does not legalize cannabis, does not guarantee that someone will not be stopped when attempting to travel to the USA, and does not erase prior criminal convictions for cannabis from before the Act came into force. “In addition to what I have already mentioned, the public should take note that under the Amendment Act, a police officer of any rank has the lawful authority to seize any amount of cannabis in the possession of any person,” Minister Weeks said. Minister Weeks said, “Today, I wish to formally announce the launch of a Public Awareness Campaign on the Decriminalisation of Cannabis, or marijuana, as it is often called. Last week we started the campaign by airing public service announcements over the radio. “You will soon see and hear other forms of communication such as social media messages and newspaper ads, all of which are designed to inform the public about the recent legislative amendment to decriminalize simple possession of cannabis. “What exactly has been decriminalized, when and why? Let me explain. “The intent of this Government to decriminalize cannabis was clearly stated in the September 2017 Speech from the Throne. Following passage by the Legislature, the Misuse of Drugs [Decriminalisation of Cannabis] Amendment Act 2017 came into effect on 20 December 2017. “It is very important to recognize that cannabis remains a controlled drug under the Misuse of Drugs Act 1972. The Misuse of Drugs [Decriminalisation of Cannabis] Amendment Act 2017 does NOT legalize the use of cannabis in Bermuda. “What the Misuse of Drugs [Decriminalisation of Cannabis] Amendment Act 2017 actually did, was to remove criminal offences for the simple possession by any person of 7 grams or less of cannabis. The Misuse of Drugs [Decriminalisation of Cannabis] Amendment Act 2017 does NOT make it legal for a person to consume, cultivate, traffic or import cannabis in any quantity. “The benefit of the decriminalisation of cannabis is that a person cannot be subjected to criminal prosecution for simple possession of 7 grams or less of cannabis. It is our hope and our belief that taking this important action will help to prevent more young black men from being placed on the proverbial “stop list” and have their lives completely altered by virtue of not being able to travel to the United States to pursue further education or to seek other opportunities. 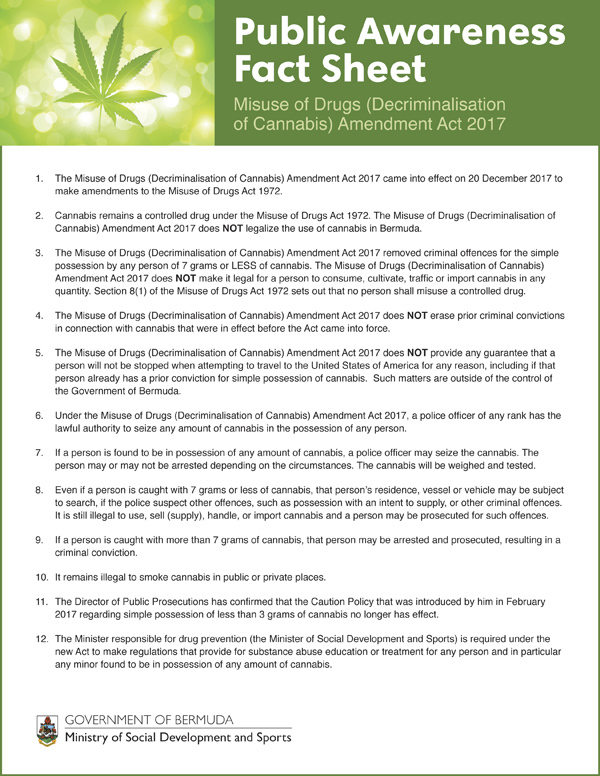 “However, it is important to understand that The Misuse of Drugs [Decriminalisation of Cannabis] Amendment Act 2017 does not provide any guarantee that a person will not be stopped when attempting to travel to the United States of America for any reason, including if that person already has a prior conviction for simple possession of cannabis. Such matters are outside of the control of the Government of Bermuda. “Let me restate, the Amendment Act does not erase prior criminal convictions in connection with cannabis that were in effect before the Act came into force. “With regard to minors, it is not our intent to remove parental responsibility, which must remain in the hands of parents, who, using their best judgment and the best information that is available to them, should provide guidance to their children regarding substance use and misuse. “However, the Amendment Act provides the Minister of Social Development and Sports with the power to make regulations in relation to substance abuse education or treatment for any person, and in particular a minor, who is found to possess any amount of cannabis. “In addition to what I have already mentioned, the public should take note that under the Amendment Act, a police officer of any rank has the lawful authority to seize any amount of cannabis in the possession of any person. Thus, the Amendment Act does not diminish the power of the police to seize cannabis from any person, including young persons, as currently provided for under the Misuse of Drugs Act 1972. “In parallel with efforts to raise public awareness on decriminalisation of cannabis, Government will continue to raise education awareness in relation to health risks associated with substance abuse in adolescents. Would be nice if they revoked all those whi have been on the Stop List. The Stop List is implemented by the U.S. Government of which the Government of Bermuda has no control. Although they can change the laws locally, they cannot manipulate a list outside of its jurisdiction. The American stop list is a list made up of the names of those charged with criminal offenses. Bermuda can’t manipulate a list outside of its jurisdiction but can and has influenced it by having cannabis possession legislated as a criminal offense. If this law did not exist the only ones being put on the stoplist would be the real criminals. Those on the list for cannabis possession and those who will continue to go on it for possession are because of Bermuda’s criminalization of the substance. All Bermuda has to do is make it legal and pardon those who have a personal possession record to stop these people from going on the list or get them removed. It’s ridiculous that people are banned from entering into a country for possession of a substance that is already legal in 9 states of the country. So if I don’t pay tax on my sugar and I get busted would I be on the stop list? How about if a former politician who swore allegiance to the US got found guilty of a crime in Bermuda (hypothetically)? The “stop list” APPLIES TO ALL COUNTRIES WORLDWIDE it is not just a Bermuda thing which people make it out to be. Guys make me laugh, America has the right to not let anyone in their country same way guys have the right to not let people into Bermuda! Mexicans caught red-handed smuggling at the border are sometimes told they are ineligible for entry into the US for 5 years, the shoe bomber and underwear bomber boarded planes to the US despite the FBI being directly warned they were a threat and the fact they were on the Terror Watch List. Bermudians on the other hand, can’t set foot on any US bound aircraft for 99 years if they are on the ‘Stop List” for even a microscopic particle of herb, unless you can buy a waiver. Why? Are one of the fools who got caught & forever tied to de rock? There’s no common sense here. The law doesn’t make any sense at all. How can 7 grams be decriminalized which means cease by legislation to treat (something) as illegal. Making something partially illegal is nonsense. Just imagine if it was legal to have a miniature bottle of alcohol but a criminal offense to have a flask and if you had a mini it would be up to the officer to search your home and vehicle for more. This is a backward law that creates further opportunity for police discrimination. Now the police will have more motive to search a person’s residence out of bias. The whole history of cannabis prohibition is based on discrimination and this law furthers it. Guaranteed there will be more of one part of society searched than the other and then more of them will be caught with possession than the other because they are searched more. It doesn’t matter if someone has 7 grams or more because it is still left up to the officer’s “discretion”. This backward law also stigmatizes adolescents who get caught with a small amount of Cannabis as addicts and disrupts their lives to go to treatment when treatment is unnecessary. We wouldn’t send a teen to AA if they were caught with a beer. This law will also encourage some children to take cannabis because of their perceived reasoning that they are less likely to get in trouble possessing small amounts. Shame on PLP for not having the cohones to abolish this backward law once and for all and has been used as a tool to allow discrimination to proliferate. Keeping Cannabis away from children will only work if looked at the same way the Trudeau administration is looking at it in Canada. PLP need to decide whether they are going the backwards route of Jeff Sessions or the forward route of more intelligent laws. It would be a good revenue stream if we just legalized it completely and taxed it. Price would come down actually and we could regulate the industry with standards to ensure a healthy smoke. The social cost would be enormous. I don’t think so, no more than it already is at least. I mean if you decriminalize it, tax it, and regulate it then it would be more socially acceptable. I know that there is some home production that goes on but I am guessing that there is a lot of money leaving the island to import weed (and other stuff). The people who smoke it have no trouble getting it they just pay exorbitant amounts for it. Tourism would likely benefit also. Results have already proven that social payback of legalization is far more than the massive cost of prohibition. After legalization, these jurisdictions experienced the outcome of the below amongst other positives. A much better revenue stream than any ICO would and there would be physical assets attached to it not blips on a screen. Juxtapose this ‘sheet’ against a Judges recent comments about roadside sobriety checks, these are allegedly unconstitutional, to randomly stop people without probable cause and infringe upon drunk drivers right to free movement and there may be room for abuse (by the cops) so the stops have to be advertised and they can only stop every tenth car, blah blah, blah. Hmmm. The cops have been randomly profiling people under the oppressive misuse of drugs act for decades, no one cared, they still have random stop and searches too despite some weak opposition. When you see the cops on their next ‘third lane’ or speeding blitz, ask yourself when are they going to have a DUI blitz (never). The war on some drugs empowers police brutality and abuses yet the drug of choice for the masses, the drug associated with violence, sickness, bad decisions and uncounted road deaths enjoys carte blanche and no real restrictions other than age. This law makes absolutely no sense whatsoever. So let me get this straight. I can possess a car but I can’t drive it. Smdh. 1. So that means the police will still confiscate my non criminal amount of weed? 2. Are they still going to arrest me, at least until they take a measurement? If so am I going to the station or will they have a “roadside” test? 3. If it’s already rolled up, how much is 7 grams? 4. If I have 7.1 grams, I’m still going on the stop list? You ask valid questions but, it’s still a controlled substance. Your best bet is to have less than 7 grams in your posession at any given time. The only objective is to set out terms to protect citizens from criminal charges for small amounts of the plant. Trying to decifer the the multiple “what if” scenarios is pointless. If you are going to consume any drug, you should act responsible and cautious. I know we won’t hear from any of the equal rights, anti-discrimination crowd on this human rights atrocity that will continue despite the 80 years too late decriminalization of small amounts of a beneficial plant. The only allowable legal smoking material is tobacco which kills in excess of 5 million people (220,000 from second hand smoke) per year and costs society billions in health care costs, you can grow, purchase or sell any amount of tonnage of this known killer, some folks are making a killing off it and government gets a cut too. Funny how no one suggests we limit cancer sticks to 7 grams, prohibit supply and start locking up addicts and dealers. Just like your “smoked” brisket and ribs? Baseless foolishness, name one person who died from smoking herb. You must think that everyone who posts here doesn’t know how to use the internet to debunk false claims . A simple search yields a ton of results . It should also be a lesson to anyone who screams alcohol abuse every time the hear of a road traffic incident . You asked for proof ,well here it is. But I’m sure you’ll say that it’s all a load of nonsense. Kevin Sabet? Come on man, when he talks you got to check and make sure you didn’t get any on you. There are numerous hazards to health from marijuana. Typical that sage denies it. It’s his main hobby. There are numerous hazards to health from alcohol that most Bermudians deny. Getting wrapped around a telephone pole after a few bevies is a hobby of many in Bermuda. Why not have our budget focused on that issue instead of on a substance causing less harm. we were discussing the health risks of marijuana. Try to keep up. Actually your the one who needs to keep up because we’re past that because there was so little to discuss. There are more important and real discussions about alcohol in Bermuda and the many harmful effects of it. Would you rather road fatalities, child, and spousal abuse keep happening from alcohol while we discuss the fallacies of cannabis like a fairytale you pretend is true? Zevon can’t walk and chew gum at the same time, take it easy on him he has wernickes encephalitis. How many search responses can I refer you to before you run out of answers ? There’s hundreds of them by the way . That’s because America has been putting reefer madness propaganda out since the 1930s. You want a search response to end all search responses then search out Harry Anslinger. He’s the one who founded the fake news about cannabis and it’s been propagating ever since. There’s no doubt that cannabis smoke is harmful to the lungs but studies on suicide and mental illness caused by cannabis have been proved inconclusive. In all cases the victim had the propensity for suicide and mental illness and most cases were using prescription medications for depression that ironically have side effects that cause depression and mental illness. Your source Kevin Sabet is politically and ideologically biased and has been debunked numerous times himself. uh…well yes, people get lung cancer from smoking pot just as easily as tobacco. That is not true. Google Donald Tashkin and his study of heavy long term cannabis smokers and his surprise in finding no association with copd, emphysema or lung cancer. This is true but if you eat or vaporize cannabis it will not kill you. Even though these two ways are healthier they both will both come with a criminal charge for larger possession amounts and paraphernalia. Just another way Bermuda prohibition laws cause more harm than good. A side note: A human adult can eat Cannabis flowers daily without harming themselves and is actually beneficial to their health. A human adult who eats cheeseburgers and fries, drinks alcohol or energy drinks daily has as much of a potential for dying from them as smoking anything daily. Anbu, it’s 2018. Healthy vaping and edibles technologies have come a long way, smoking isn’t required. There are also beverages and even minty oral sprays being developed. There’s even MJ for pets! So basically you’re taking the punishment away from 7 grams or less but still allowing the Police to confiscate the amount. Who is making this drivel up? A third grader? Baby steps. In about 10 years we will be laughing at the fact that it was ever illegal. The train has left the station on this and no way is it stopping. It’s just a matter of time. Many countries and states see it as an opportunity to make lots of tax dollars, lower opiate addiction rates, and safely treat a malady of medical symptoms. Should have never been made illegal in the 1930s in the first place. Baby steps is too slow and allows abuses perpetrated by the ‘authorities’ to continue. Nothing has really changed they have just legitimized the practice of letting, who they choose, off. Cannabis needs to be immediately removed from the schedule of drugs, all penalties suspended, full pardons, renumeration, apologies and exclusive rights to business formation once it is re-legalized. Any thing else is folly. I hear and totally agree with you. I have been an advocate of legalization since the 90s. But you as well as I know how slow progress in Bermuda can take. I am just saying to everyone that this is the first very small step in what will eventually be full legalization here. The older generation is stopping progress in many aspects because they don’t understand what is important for future generations. They are stuck in their 1960s mindsets and only once they retire from the political scene will true progress be made. This is true for not only Bermuda but many western countries. In the meantime people like us can only do our best to educate those that are misinformed on this issue. Full legalization, cultivation and taxation will be the salvation of our financial situation!!! It would be but will never happen in Bermuda until the rest of the world has legalized and saturated the market so much Bermuda has no way in. There are too many in Bermuda who looked for God and found religion instead. Their high goes beyond reason so there’s no reasoning with them. Just say no to ganja tax. The rest yes, we shouldn’t be bailing out the government giving them more money to waste/misappropriate. It’s amazing to me to read Minister Weeks speech and to find once again that this amendment is focused on helping to prevent “Black Males” from being put on the stop list. When will we have a Government that is for all the people in this country. Sick and tired of this racial BS that both these parties spue. Legalize weed. Let us grow our own to eliminate importation and we will be able to drink and eat it. The way God intended. Stop the BS and let’s grow up and do this or put on ur big boy and girl pants and tell everyone it’s going to never be legal and move on. It’s all hot air anyway. It hasn’t been thought out. It’s obvious that they’re just tossing it up and hoping it sticks. This shows their incompetence as the government to do real research. It’s true more blacks males are charged with possession than white males but you have a point De Truth. OBA and PLP both have ministers that make biased remarks showing they are speaking of opinion not researched facts. OBA put together the Cannabis Reform Collaborative and then Dunkley ignored everything they proposed because of his opinion. Now Minister Weeks seems not to care about the research either but pretends to care about “Black Males” to get keep getting black votes. If PLP really cared they’d do the research. This amendment won’t stop anyone of any shade from going on the stoplist because in Bermuda cannabis possession will still be illegal. are you allowed smoke weed in your car with Bob full blast? So it’s not a criminal offence to own 7 grams, but the Police can seize any amount. Even though you own it lawfully. Sounds like the usual PLP effed up way of passing laws. They screw it up, and another government comes along later and redrafts the law so that it actually makes sense.